The first of four new Guardian Class Patrol Boats was handed over to Papua New Guinea on Friday at a ceremony at Austal Ships, Henderson, Western Australia. The four patrol boats destined for New Guinea are part of a program which will eventually see 21 boats gifted to Pacific island nations. Part of the Pacific Patrol Boat Replacement Project, the new boat has a maximum speed of 20 knots and is designed for a crew of 23 sailors and officers. Minister for Defence Industry the Honourable Steven Ciobo, MP said the project highlighted the close relationship between Australia and her Pacific Nation neighbours. “These Guardian Class Patrol Boats are being gifted to 12 Pacific nations and Timor-Leste as part of Australia’s Pacific Maritime Security Program,” he said. “It really speaks to the nature of the relationship not only between Australia and PNG, but also between Australia and all Pacific island countries and Timor Leste. The handover of the vessel marks the first of 21 patrol boats that will be gifted to Pacific island nations and Timor Leste to enhance maritime security across the region. The build of the vessels is worth more than $350 million, with the next boat to be gifted to Tuvalu in April 2019 - Austal expects a boat to be delivered every four months thereafter. The Guardian Class Patrol Boats were designed to replace the ageing Pacific Forum Class vessels that Pacific nations had been operating since they were introduced in the late 1980s. The first-of-class Guardian Patrol Boat was named after Edward (Ted) Diro, a former PNG soldier and politician. The vessel’s twin diesel engines can provide 400kw of power, and specially designed electronic engine controls will help conserve fuel. Among the PNG delegation to attend the ceremony were the Minister for Defence the Honourable Solan Mirisim, MP, Secretary of Defence Mr Trevor Meauri, and Chief of the PNG Defence Force Major General Gilbert Toropo, CBE. The Australian Defence Force was represented by a number of senior officers including Chief of Defence Force General Angus Campbell, AO, DSC, and General Manager Ships Rear Admiral Anthony Dalton, RAN. 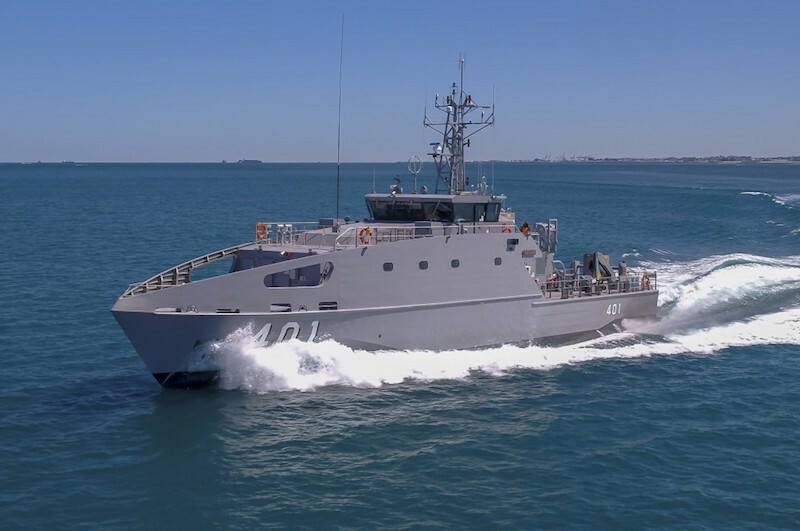 The Guardian Class is the latest evolution of Austal’s proven patrol boat platform that was first introduced some 20 years ago, commencing with the Bay Class Patrol Boat developed for the Australian Customs Service. Since 1998, Austal has delivered 32 patrol boats to the Commonwealth – representing Australia’s entire border patrol capability. Indeed, Austal has delivered or has orders for a total of 97 patrol boats for Australia and around the world.